One of the best art museums in the world, the National Gallery of Australia (NGA) is the largest art museum in the country with more than 166,000 works of art. Located in Canberra (ACT), it was founded in 1967 as Australia's national public art gallery, and receives roughly 770,000 visitors per year, making it the world's 83rd most visited art museum. The NGA has the finest collection of Australian art anywhere in the world. It includes Aboriginal art, Australian Colonial Painting (from 1788), Australian Impressionism (1886-1900), Australian Modern Painting and a wide range of contemporary art up to the present. As well as this, it has an extensive variety of Asian art, and a collection of Oceanic art. Other important art venues in Australia include: the National Gallery of Victoria in Melbourne, the Queensland Art Gallery (QAG) in Brisbane, the Art Gallery of New South Wales (AGNSW), the Art Gallery of South Australia (AGSA), the Art Gallery of Western Australia (AGWA), and the Museum of Contemporary Art (MCA) in Sydney. As early as 1910, following representations by Tom Roberts (1856-1931), leader of the Heidelberg School, the Australian Prime Minister Andrew Fisher agreed to the idea of some form of national art gallery. Nonetheless, it wasn't until 1967 that action was taken after Prime Minister Harold Holt formally announced that the Government would construct the gallery building. Designed by Colin Madigan (Edwards Madigan Torzillo and Partners) in the late 20th-century Brutalist style of 20th-century architecture, construction of the gallery started in 1973, with an unveiling ceremony conducted by Prime Minister Gough Whitlam, and it was officially completed in 1982, at a cost of $82 million. The gallery was subsequently extended in 1997 and in 2006. The National Gallery of Australia's permanent collection contains some 160,000 items, divided across five main areas: (1) Australian art (1788-present). (2) Aboriginal Art (including works by Torres Strait Islanders). (3) Asian art, subdivided into Art of the Indian subcontinent, Art of East Asia, and Art of SE Asia. (4) European and American art (Impressionism to Postmodernist art). (5) Pacific Arts (1500 BCE-present) mainly traditional objects from Melanesia, Micronesia, Polynesia, and from Papua New Guinea to New Zealand. 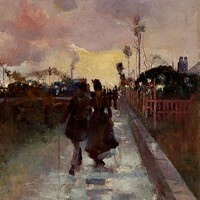 Aside from its definitive collection of Australian art, the collection is especially strong in European modern art of the first half of the 20th century; American art of the 20th century; Asian art; 20th-century drawing and fine art photography, including works by some of the greatest photographers around the world. Highlights include Impressionist paintings by artists like Fred McCubbin (1855-1917), Tom Roberts (1856-1931), Arthur Streeton (1867-1943) and Charles Conder (1868-1909). Note however, that while Roberts and his group used a loose style of brushwork, which gave their paintings an 'impressionistic' appearance, they were too drawn to naturalism and the style favoured by the Barbizon School of landscape painting to embrace full-blown French Impressionism. The gallery's Australian collection of modern paintings, created during the 1920s and 1930s includes, works by Grace Cossington Smith, Margaret Preston and Kathleen O'Connor, all of whom instilled new energy into still life, portraiture and landscape. Other modernists in the collection include: Russell Drysdale, the Cubist Rah Fizelle and the surrealist Peter Purves Smith. Others examples of Surrealism include works by Sidney Nolan, Robert Klippel, Ivor Francis, Max Ebert, Dusan Mareck, Albert Tucker, Arthur Boyd, James Cant and Max Dupain. Australia's early abstract and semi-abstract art is represented by Roy de Maistre, Roland Wakelin, Grace Crowley and Ralph Balson, among others. Other modern art movements of the 1950s and 1960s are represented by Australian artists including, John Perceval, Joy Hester, Noel Counihan, Yosl Bergner, Godfrey Miller, Tony Tuckson, John Olsen and Ian Fairweather, plus the sculptors Lenton Parr, Julius Kane, Norma Redpath and Inge King. The Australian school of abstract expressionism is exemplified in the collection by Robert Rooney, David Aspden, Sydney Ball, Gunter Christmann and Robert Jacks, while Australian crafts are represented by the ceramic art of Milton Moon, Alan Peascod, Les Blakebrough and Mitsuo Shoji, and by the jewellery art of Susan Cohn, Marion Hosking, Helge Larsen and Darani Lewers, to name but a few. The Australian art collection also embraces a variety of avant-garde art by postmodernist artists in several disciplines. Belonging to the oldest continuous living tradition of art, this 7500-item collection is, above all, concerned with the land and the indigenous peoples' relationship with it. Highlights include: The Aboriginal Memorial; elaborate Torres Strait Island masks; aboriginal batik and printed textiles from central Australia; watercolour painting by the Hermannsburg School of Albert Namatjira; and bark Paintings from North Queensland and the Tiwi Islands. NOTE: the recently discovered Sulawesi Cave art, dating to at least 37,900 BCE, is easily the oldest Stone Age art ever found on the route between SE Asia and Australia, and has profound implications for the dating of Australian Aboriginal art. The most important and comprehensive collection of Asian art in Australia, this collection showcases sculptures, textiles, paintings, prints, manuscripts and photographs in three separate galleries - Art of the Indian subcontinent, Art of East Asia, Art of South-East Asia. The collection features Chinese Buddhist sculpture, plus Hindu, Jain, Islamic, and Christian sculpture, including masterworks from India, Southeast Asia and Japan. The Asian department is also well known for its highly visual assembly of South and Southeast Asian textiles, notably from Indonesia. Other treasures include elegant examples of Japanese six-fold screens, shrine hangings exalting India's popular god Krishna, vibrant costumes from Central Asia, Chinese pottery used in funerary ceremonials, vivid miniature painting from India, delicate Balinese illustrated manuscripts, important Ukiyo-e woodblock prints from the Edo and early Meiji periods of Japanese art, along with a rare series of 20th-century Chinese woodcuts. This collection mainly includes painting and sculpture from the late 19th-century and early 20th-century (featuring movements like Impressionism, Post-Impressionism, Expressionism, Fauvism, Cubism, Ecole de Paris, Dada and Surrealism, Abstract Expressionism and Pop Art, Minimalism and Conceptual Art), as well as drawings and poster art, and works representing design movements such as Art Nouveau, the Bauhaus Design School, and the modernist idiom of Art Deco. A number of collages by Kurt Schwitters, kinetic art by Jean Tinguely and screenprints by Andy Warhol are also represented. A legacy of three trips to Papua New Guinea by Sir William Dargie, who helped to assemble this collection of native tribal art from the Pacific region, it also includes an excellent selection of 18th and 19thcentury Maori art, the Charpentier collection from the Vanuatu archipelago, and single items such as the prehistoric Ambum stone (a prehistoric zoomorphic figure; possibly depicting the embryo of a long-beaked echidna) and the wood carving known as the Lake Sentani double figure, characteristic of figurative art from the central north coast of West Papua, acquired in 1929 by Jacque Viot. As the collection tries to make clear, Oceanic artifacts - like body painting, tattooing and face-painting - were not considered to be "art" as the word is used in the West. Instead painting, sculpture and wood-carving were seen by Pacific islanders as natural and integral elements of the religious and social ceremonies of everyday island life, bound up with the forms of ancestor-worship and spirit-worship then prevalent. Designed by Harry Howard and Associates and NGA director James Mollison, the gallery's sculpture garden contains 26 sculptures made by International and Australian artists. They include works by Auguste Rodin, Emile Bourdelle, Aristide Maillol, Gaston Lachaise, Henry Moore, Mark di Suvero, Bert Flugelman, Robert Stackhouse, Willi Taso, Clement Meadmore, Robert Klippel, Inge King, Richard Stankiewicz, Antony Gormley, Rick Amor, Boniface Alimankinni, and others. Here is a short selection of outstanding works from the collection of Australian art. Here is a short selection of outstanding works from the collection of European and American art. Kakadu National Park, Northern Territory. Most ancient art in Australia to be validated by carbon-dating.  For more details about painting & sculpture in Australia, see: Homepage.